Acht Stunden sind kein Tag (Eight Hours Don’t Make a Day), 1972–73, still from Rainer Werner Fassbinder’s TV show on WDR. Episode 1, “Jochen and Marion.” Jochen Epp (Gottfried John) and Marion Andreas (Hanna Schygulla). OPENING WITH the explosion of a champagne cork that unleashes a chain reaction of casual domestic violence mixed with drunken laughter, Rainer Werner Fassbinder’s Acht Stunden sind kein Tag (Eight Hours Don’t Make a Day)—a five-episode series made in 1972 for Westdeutscher Rundfunk, the largest of Germany’s regional television broadcasters—identifies the good guys and the meanies in the first two minutes. It was Fassbinder’s first major TV work; in the previous seven years, he had made fourteen feature films as well as numerous plays that defined him as not only the most prolific but also the most politically audacious, toughminded, and aesthetically inventive postwar German artist working in narrative media. At that moment, producing a TV series for a mainstream audience was the most radical move he could make. Restored in 2017 by the Fassbinder Foundation and finally released this year in the United States, Eight Hourshas more than enough cinematic pleasures, engaging characters, and narrative surprises for the most discerning of binge viewers. Challenging the expectations raised by the subtitle, A Family Series, Fassbinder created not another staid bourgeois drama but an emphatically positive depiction of working class life. Its elliptical narrative, multidimensional characters, and mise-en-scène that combined blocking and camera movement to depict shifting power dynamics would not have surprised viewers of Fassbinder’s theatrical movies, but they were out of line with the conventions of TV. 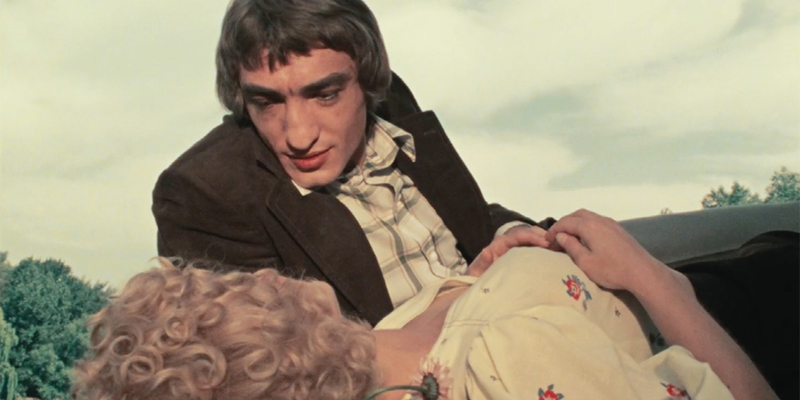 The series was shot in 16 mm by Fassbinder’s long-standing cinematographer Dietrich Lohmann, and the image is as rich as those in all their collaborations. Brief as it is, a shot of two characters through the slats of a wooden chair during a raucous family dinner in the first episode is a pleasurable reminder that this is not transparent TV realism but a picture of German domesticity from the point of view of a brilliant social critic whose politics was conveyed in and through moving images. That first scene, with the carelessly opened champagne, takes place at the sixtieth-birthday celebration of Oma (Luise Ullrich), the witty, diminutive, and headstrong matriarch of the Krüger family. The central character is her grandson Jochen (Gottfried John), who has popped the cork and will pop many more, at least metaphorically, throughout all five episodes. John’s imposing physical presence (he has a lanky, broad-shouldered body and large facial features—his nose appears to be three times bigger than that of a typical male leading actor) turns him into the inevitable focus of attention, but it’s his ability to expressively puzzle out problems that are more complicated than words allow that makes him such a rich resource for Fassbinder. Jochen excuses himself from the party to buy more bubbly, and at the food-and-drink automat he meets Marion (Hanna Schygulla), who is shopping for pickles. Their instant attraction blossoms (did I mention the wild abundance of flowers in this first episode?) into a romance that constitutes one of the series two central narrative threads. During one of their first dates, they get into a conversation that any Marxist will recognize as being about alienated labor. But they are not theorizing. When Marion asks Jochen how he can be satisfied working in a factory where he makes tools that go inside large machines and thus are never seen, she is already worrying that her mother will never approve of her marrying a factory worker. But Jochen also wonders how Marion cannot understand that her job selling classified ads at a daily newspaper is no different. The “eight hours” in the title refers to the standard length of a working day, and life on the factory floor gets as much attention as the characters’ intricate familial and romantic relationships. Jochen is the link between these two equally important story lines. And when the boss at Jochen’s factory fails to pay promised bonuses to the assembly-line team for finishing a job on time, it is Marion who encourages resistance and solidarity. A few “accidents” at work soon demonstrate where the power truly lies. Throughout, striking visual compositions and editing remind us that Fassbinder’s camera is always a thinking machine. The series benefits from supporting performances by many stock actors from the Fassbinder company, but it is John, Schygulla, and Ullrich—with their astonishing ability to respond spontaneously as the camera rolls, while never departing from Fassbinder’s complex script and choreography—who make Eight Hours Don’t Make a Day so engaging in its humanism. It was, according to Fassbinder, the first time he had deliberately made “something positive . . . something hopeful.” His intention was to encourage working-class viewers to be aware of their strength. If the factory floor is no longer a primary site of resistance, there are still lessons to be learned for today’s political—and cultural—playing field. At a time when TV reigns, Eight Hours is the anomaly that inspires. Eight Hours Don’t Make a Day opens on March 14 at Film Forum in New York.